Relive the most important elements of our faith. Holy Week begins with Palm Sunday. It is the most solemn and sacred week of the Church’s year, because during it we relive the most important elements of our faith. 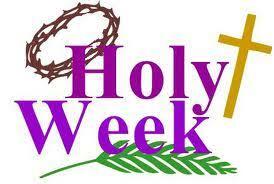 We invite and encourage all parishioners to make a special effort to attend the Holy Week Ceremonies. Let’s together make it a “Spiritual Easter” of prayer and reflection. The Chrism Mass, with the blessing of the Holy Oils, will be celebrated on Wednesday 17 April at 7.30 pm at the Cathedral, Thurles, by Archbishop Kieran O’Reilly SMA. All are welcome, and especially those receiving Confirmation this year with their families. Holy Thursday: Mass of the Lord’s Supper 7.30 pm. Trócaire offerings converted to notes and handed in. Holy Communion Ministers renew their commitment. Please stay for the Holy Hour immediately following. Good Friday: Celebration of the Lord’s Passion 3.00 pm. Collection for the Holy Places. Holy Saturday: Vigil Mass of the Resurrection at 7.30 pm. Easter water blessed and available after Mass. Please stay for the Holy Hour immediately following when Confession will be available. Good Friday: Liturgy for Good Friday 7.30 pm. Holy Saturday: Vigil Mass of the Resurrection 6.30 pm. Easter water available after Mass.